Through a bottom-up approach the expertise of the numerous experts within EMBRIO will be profited from by jointly developing an overall EMBRIO strategy. Experts with innovative scientific ideas and openness towards collaborative research will have a particularly strong impact on the EMBRIO strategy. 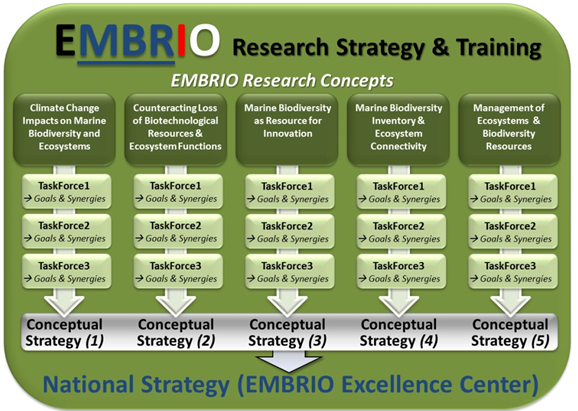 The EMBRIO Research Concepts will serve as the basis for targeted approaches to jointly determine multi-disciplinary Research Focus Areas within EMBRIO by identifying common research goals and potential synergies among the experts from different scientific fields. By bringing together scientists from different disciplines and research units, the Task Forces will serve as “think-tanks” for the development of joint, interdisciplinary grant proposals that will ultimately result in new multi-partner research projects. Key to successful Marine Biodiversity Research is conducting field studies in marine ecosystems. So far, the organization of Marine Biodiversity field excursions in Indonesia is largely scattered since on-site research infrastructure with good access to marine experimental resources is limited. 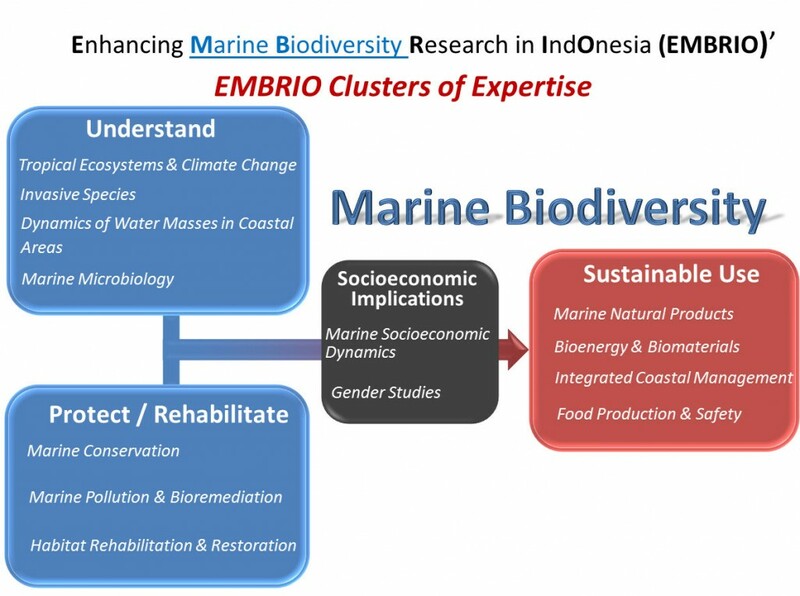 A clear and unequivocal outcome of the numerous discussions held in the frame of EMBRIO is the need for field stations both in stressed and pristine areas covering all three types of major tropical marine ecosystems (coral reefs, mangroves, seagrass beds). Infrastructure for reliable housing, experimental work and transportation has to be developed at selected locations to achieve an international standard. This is of great importance to facilitate state-of-the-art research and to attract strong international partners to joint field research projects. Next to establishing field stations, EMBRIO aims to generally promote the joint utilization of research facilities that are cost-intensive in their acquisition and/or maintenance, this way increasing the efficiency of their use and their interdisciplinary character. The coordination of such activities will be promoted by the EMBRIO Management Office.